Gal Gadot’s Amazon Warrior could be headed to Gotham in 2017, according to a new set photo that emerged from the ongoing production of Warner’s Wonder Woman movie. 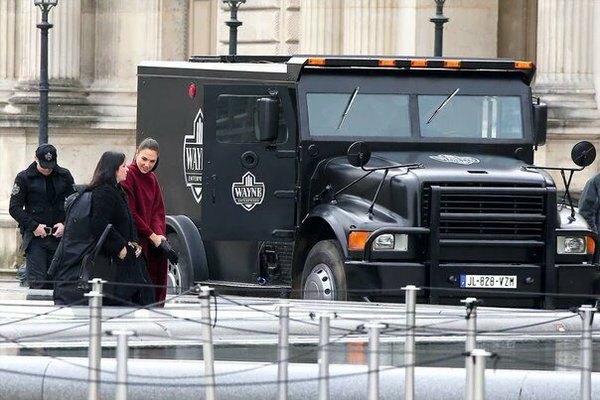 First spotted by Batman-News, the image places Gadot’s Diana Prince alongside an armored vehicle bearing the iconic Wayne Enterprises sigil. Fuelling speculation that Patty Jenkins’ solo movie could feature a Batman crossover, it’s also worth noting that the photo is taken in a modern-day setting, supporting previous claims that 2017’s Wonder Woman movie will take place across two or more time periods. It all begins on Themyscira circa World War I, though, where Diana Prince is housed up with her fellow Amazonians – Queen Hippolyta (Connie Nielsen), General Antiope (Robin Wright) and Menalippe (Lisa Loven Kongsli). Bringing that harmony to a close is the arrival of Chris Pine’s Steve Trevor, seeding a budding romance between Pine’s downed pilot and Gadot’s heroine. Arriving off the back of Dawn of Justice and David Ayer’s Suicide Squad, the actress also spoke previously about the “moments of humor” peppered across Patty Jenkins’ superhero feature. With Gadot and Pine leading the ensemble, Wonder Woman has also cast Lucy Davis, Danny Huston, Ewen Bremner, Saïd Taghmaoui, Elena Anaya and David Thewlis. Headed up by Patty Jenkins, Gal Gadot will make her standalone debut as Wonder Woman on June 23, 2017.